There I go again. | The zealot of fashion. It's been 2 months, well, almost 2 months since I last blogged. I've been doing a lot of slacking and also working on my new site with my friend Nicole (http://lookbook.nu/mizerabilia). Mainly focusing on street style photography of alternative fashion, being heavily influenced by Japanese fashion and culture. Click on the logo to be directed to our site. We do our snapping on a weekly basis depending on the amount of awesomely dressed people we get. Also, we join Japanese fashion/culture related events to get more exposure. We recently just attended the Asia Style Collection 2013 featuring K-POP Fashion & Tokyo Girls Collection. Well, the only thing I was excited about was the appearance of 2ne1, which I did not pay two hundred over dollars just to see them sing one song or two. But fortunately we met some familiar faces and awesome people to snap! Also, do like us on our Facebook page (https://www.facebook.com/straykatssnapklub.1), follow our twitter (https://twitter.com/StrayKatsSK) & Instagram (http://instagram.com/straykatssk). Here are some of the awesome people we took that I personally love! The bottom 2 of me & Nicole aren't posted yet but you guys get to see the preview. Hehehe~ All photos are taken by me, except photos of me, taken by my boyfriend or Nicole. One of the main joys about doing this is meeting cool people. We met local rapper H!zzy, host of WOWJapan Valerie, blogger Kelly Konomi & Jeremy Hellven, graphic designer Slayedoll & staffers of local brand Depression Chris & Yika. 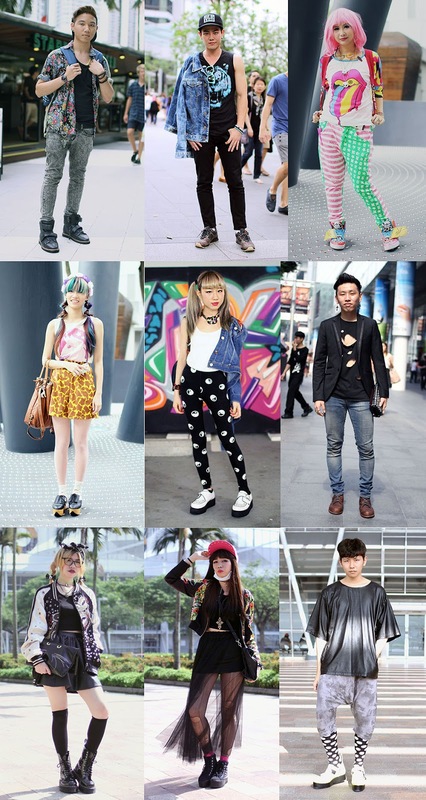 But most importantly is to see that there are people in Singapore who differs from the norm to be themselves and dress creatively with individuality. Our target is to expand our network and encourage the youths of Singapore to be bold of their choice of fashion and don't just wear whatever everyone is wearing or just wear what people want you to wear to fit in. It's okay to be different as long as you're happy doing it! Stay original and cool!